Some days ago, on the cab to work, I noticed yellow banners hanging from the trees and lamp posts we passed. My thoughts immediately went to former Pres. Corazon Aquino, widow of martyred Benigno Aquino, opposition leader during the disgraced dictator Marcos' time. Some days after that, on my way to work, I stopped by at the 7'11 outside our village. I bought MineShine (milk tea) and potato chips. On the counter, there was a plastic canister filled with free yellow ribbons, the kind you can pin on your shirt. I got one and taped it to my computer monitor at work. Two days after that, I went online, and was met with the news that Cory had passed away, at 3.18 am of August 1. August is a month of heroism in the Philippines. 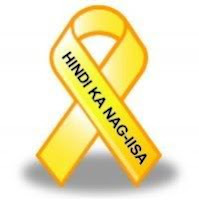 Benigno Aquino was shot, an airplane step away from setting foot on the land of his people, the Filipinos he was convinced were worth dying for, on August 21, 1983. It is an august month, even more so now. I have to share this, as Cory was a devout Catholic and a Marian devotee, specifically of Our Lady of Fatima: She died in the Hour of Divine Mercy, on a First Saturday, while her children were praying the Sorrowful Mysteries of the Holy Rosary. She was put in power by way of a peaceful revolution, with people holding flowers, rosaries and Marian images, empowered by prayer, overwhelming tanks and heavily armed soldiers. To commemorate this people power revolution, a giant statue of an Asian-looking Virgin Mary stands in the middle of the country's busiest highway. I'm saddened, grateful, and filled with hope, seeing how my increasingly fragmented country can still be united, albeit in grief. The same heart beating yet again in all of us. Remembering.